Bratz has overtaken Barbie in many parts of the world as the number one selling fashion doll. The dolls have a whole world available to them--besides the dolls, there are playsets, outfits, fashions for girls, even dvds and video games and a theatrical movie release slated for 2006. The dolls have even won several toy industry awards including Character Brand License of the Year from Licensing Industry Merchandisers Association (LIMA), as well as several Toy of the Year and other awards from Family Fun and the Toy Industry Association (TIA). Bratz are available in nearly 70 countries worldwide. In June 2001, the first four Bratz dolls, Jade, Cloe, Sasha, and Yasmin, were released to market, each attired in urban-styled fashions. The Bratz quickly gained strong popularity, becoming the number one doll brand in several countries like France, Spain, Israel and Italy, and the number two doll in the United Kingdom. The dolls won Family Fun's Toy of the Year award and TIA People's Choice Toy of the Year Award for 2001. In 2002, the Bratz became the Girls' Toy of the Year in the United Kingdom, later making a serious competition for a long-time #1 fashion doll, Barbie, and became the phenomenon worldwide. In addition to the dolls, the Bratz line includes playsets, vehicles, accessories, Lil Bratz, the Bratz Babyz, plush Petz, ("Catz", "Dogz" and "Foxz"), collectible posters and a series of video games developed by Blitz Games. In January 2004, Lil Bratz took over the #1 spot of mini-dolls by Polly Pocket in the United Kingdom. In August 2004, a straight-to-video animated movie, Bratz: Starrin & Stylin', was released. In fall 2004, Bratz dolls outsold their rival, Barbie dolls, and became #1 in the United Kingdom. In 2005, the Bratz' fashion style moved away from urban themes and towards more everyday styles. This was the year the Play Sportz line debuted, in which each Bratz girl was dressed for a different sporting activity, with coordinating accessories. Other collections included I-Candyz, Live In Concert/ Space Angelz Pop Stars , Treasures!, DynaMite Rock It! (boys only), Step Out! (celebrating the Bratz 5th anniversary), Step Off!, Birthday Bash (80s inspired), Campfire (warm winter camping gear and furry boots), Midnight Dance (a goth-esque collection with capes and detailed masks), Hollywood Style (dressed for a Hollywood premiere in repeat Bratz formal fashions), Wild Wild West, and Rock Angelz (70s rocker style), which was the Bratz flagship collection for that year. Cloe, Sasha, Jade, Yasmin, Roxxi, and Meygan as the Rock Angelz, were dressed in 70s inspired rock attire. Each girl except Meygan, their #1 fan club president, had a guitar and a mini CD single including 2 songs. Many tie-in products were also released, including boomboxes, CD towers, guitars, fashion accessories, the CD, the single "So Good", the UK bestselling, and 2005's #1 girl-targeted videogame published by THQ and the DVD, which showcased the Bratz in a computer-animated adventure as they started up their own fashion magazine. At the end of 2005, MGA Entertainment entered the lucrative mobile phone market by introducing Bratz Mobile. The lone offering for Bratz Mobile was a Sony Ericsson T290a candybar style mobile phone pre-loaded with exclusive Bratz-themed wallpapers, ringtones, games, and screensavers. Following the success of the Bratz Rock Angelz collection, MGA Entertainment released their flagship collection for 2006, Bratz Genie Magic. The collection included Cloe, Sasha, Jade, Meygan, and Yasmin dressed in extravagant and elaborate Moroccan/Egyptian/Bohemian-style fashions. Also included in the Bratz Genie Magic collection is Katia, who was released with a Genie Magic bottle playset that converted itself into a late night lounge, and like Rock Angelz, Genie Magic had accompanying tie-in lifestyle products. Genie Magic would prove to be one of the biggest selling Bratz collections in the company's history. Highlighting the release of the Bratz Genie Magic collection was the release of the Bratz Genie Magic DVD and CD in April 2006, which also won the Parent to Parent Adding Wisdom Award. In May 2006, MGA Entertainment announced that legal issues forced the company to remove Kiana, introduced in the Wild Wild West collection, from the Bratz Pack, because Mattel, Inc. claimed that they owned a trademark to the name "Kianna" with their Teen Trends doll line and that MGA Entertainment's Wild Wild West Kiana doll infringed upon their trademark. MGA Entertainment thus ceased further usage of the name "Kiana" and will not produce any more Bratz dolls bearing the name. This would be the first of several cancellations for MGA in 2006; plans to release Leah and Meygan in a second wave of the Midnight Dance collection were scrapped, as were plans for Nevra and Jade for the Play Sportz collection. To date, no reason has been given for the cancellations. In August 2006, MGA Entertainment released the kid version of Bratz Kidz and its platinum vintage Bratz collection, Bratz Forever Diamondz, which is one of the most expensive Bratz doll collections ever released with only one fashion. The characters featured in the Forever Diamondz collection are Jade, Cloe, Sasha,Yasmin, and a new character named Sharidan. Included with each doll in the Forever Diamondz collection is a diamond gem with a certificate of authentication. Also included with each doll in the collection is a code that girls enter on the Bratz official website, where they have a chance to win a one carat (200 mg) diamond. Also included with the Bratz Forever Diamondz collection is a "Fashion Show On The Go" rolling runway playset, a Fashion Design Kit Studio, the RC Cruiser, and Funky Fashion Makeover styling heads. Vinessa were later releases in the Forever Diamondz collection; they retailed for $19.99 each and were packaged not with a real diamond, but with a coordinating T-shirt and denim skirt and an array of simulated gems with which to decorate the second outfit. Even before the formal release of Bratz Forever Diamondz, the collection had apparently already won the Australian Girls Toy of the Year award. On September 26, 2006, a new DVD released with the same title. The CD with the same name released on September 19, 2006. THQ released a videogame on September 18, 2006. THQ hopes for the same or greater success for Bratz Forever Diamondz, just like the same success that they achieved with the Bratz Rock Angelz video game, which has sold over 1.4 million copies worldwide since the release and became the #1 girl video game in 2005. MGA, along with Canadian based fashion designer Marie Saint Pierre, teamed up to create an exclusive line of French-Canadian Bratz called 'Ohh laa laa' featuring three new exclusive characters. The line debuted in Sensation Mode, part of Montreal Fashion Week on October 16, 2006. The line is exclusive to Wal-Mart in Canada and only 30,000 were made. 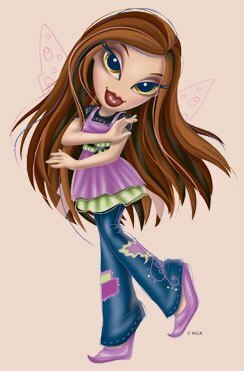 In 2007, MGA presented Bratz Adventure Girlz (hip camouflaged camping clothes and gear), Fashion Pixiez (fairy themed dolls with glitter and wings with a direct-to-DVD and a music CD), and second waves of the Passion 4 Fashion and Birthday collections. Other collections included Pampered Pupz (stylized dolls with matching dogs and dog outfits), and Magic Hair (5-in-1 hairstyling 10 inch dolls with real memory hair). MGA Entertainment, Avi Arad Productions and Crystal Sky Pictures announced that they were to jointly produce a Bratz live action movie to be released on August 3, 2007. On February 6, 2007 according to NPD Group, the Bratz became the #1 fashion themed dolls in the USA in the fourth Quarter of 2006. The Bratz also had a live concert tour with the title Passion 4 Fashion World Tour from March 30 - April 25 exclusively in the UK. 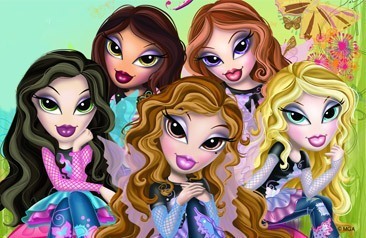 The Australian distributor of Bratz dolls held a design competition across multiple age groups with the task to design outfits for various categories. The entries closed at the end of July 2007.